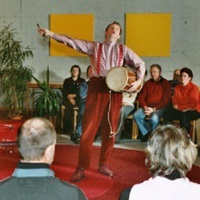 Stefan Kuntz is a storyteller, who performs as well in English. This guides you to more informations in German. "The Stranger", about a mother and her son, who don't know what the day comes up with. My newest production is a story about my mothers during the NAZI-time ("Dance, till the sparkles fly"), how they got involved in the NAZI-system, how they got out but not completely. More in German here.